Apple launches iPhone SE with 4-inch display and A9 CPU. 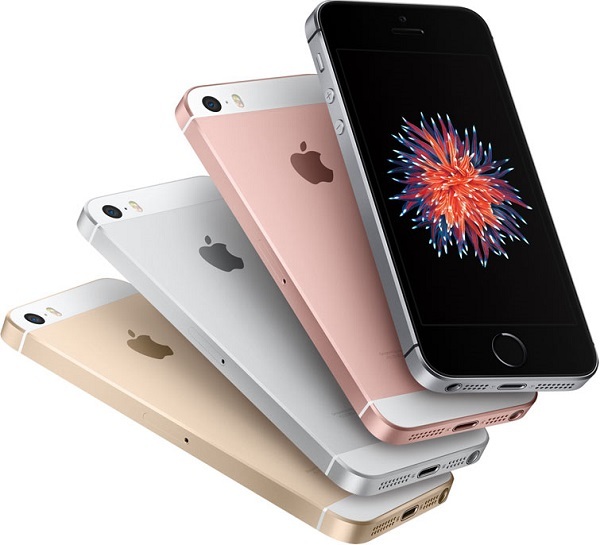 Apple today launched iPhone SE with a 4-inch display, in a compact aluminum design that has been updated with matte-chamfered edges, a color-matched stainless steel Apple logo, and four gorgeous metallic finishes, including rose gold. iPhone SE offers exceptional performance with the same 64-bit A9 chip offered in iPhone 6s and iPhone 6s Plus for blazing fast speeds, longer battery life, faster wireless, a 12-megapixel iSight camera featuring Live Photos and 4K video, and Touch ID with Apple Pay. iPhone SE comes with a 64-bit A9 chip, introduced in iPhone 6s and iPhone 6s Plus, offers iPhone SE customers two times faster CPU and three times faster GPU performance compared to iPhone 5s, all with gains in energy efficiency for improved battery life. M9, Apple's next-generation motion coprocessor, is integrated into A9 allowing more features to run all the time at lower power, including "Hey Siri" without having to pick up your iPhone, and a range of fitness tracking capabilities like measuring your steps and distance. iPhone SE users can browse, download and stream content even faster with Wi-Fi up to three times and LTE up to 50 percent faster than iPhone 5s. iPhone SE also includes more LTE bands for better worldwide roaming and supports Voice over LTE and Wi-Fi calling for high-quality wideband calls. With an easy-to-use interface, amazing features, and security at its core, iOS 9 is the foundation of iPhone SE and brings powerful built-in apps like Messages, FaceTime, Photos, Music and Maps to iPhone users. iOS 9 also brings more intelligence to iPhone SE with proactive assistance, powerful search, improved Siri features, and a new Night Shift feature that uses your iPhone SE's clock and geolocation to automatically adjust the colors in the display to the warmer end of the spectrum after dark and may even help you get a better night's sleep. iPhone SE has an advanced 12-megapixel iSight camera featuring Focus Pixel technology for fast focusing, an Apple-designed image signal processor, advanced noise reduction, third-generation local tone mapping and better face detection, all resulting in sharper, more detailed photos like the ones shot on iPhone 6s. With Live Photos on iPhone SE, users can go beyond snapshots to capture moments in motion and relive unforgettable memories with sound. Live Photos are beautiful 12-megapixel photos that, with just a touch, reveal the moments immediately before and after the shot was taken, so users can enjoy a living memory rather than an instant frozen in time. + The ability to shoot HD video with support for 4K at a resolution of 3840 x 2160. After capturing 4K video, customers can edit on a Mac, PC or iPad, and with the latest version of iMovie on iPhone, can even edit two simultaneous streams of 4K on iPhone SE. + Retina Flash, which momentarily makes the display three times brighter with True Tone lighting technology, for wonderfully bright selfies in low light with the FaceTime HD camera. + Features introduced with iPhone 6s, including up to 63-megapixel panorama photos, video capture up to 60fps for 1080p video and 240fps for slo-mo, time-lapse with video stabilization and cinematic video stabilization. + iPhone SE will be available in space gray, silver, gold and rose gold metallic finishes in 16GB and 64GB models starting at $399 (US) from Apple's retail stores, Apple.com, Apple Authorized Resellers and select carriers, or for 24 monthly payments starting at $17 (US) exclusively at Apple's retail stores in the US. As part of the newly-announced Trade Up with Installments program at Apple stores in the US, customers can also purchase iPhone SE for as low as $10/month for 24 months. + Customers in Australia, Canada, China, France, Germany, Hong Kong, Japan, New Zealand, Puerto Rico, Singapore, the UK, US Virgin Islands and the US will be able to order iPhone SE beginning Thursday, March 24, with availability beginning Thursday, March 31.